The Supremes once sang “you can’t hurry love” and Epic Games can testify to that. Fortnite’s Valentine’s Day update is finally live, after the romantic holiday, due to a series of delays. Want to be the best? Check out our Fortnite Battle Royale tips. Fortnite’s Valentine’s Day update was due to be released on February 8 but has been delayed twice since the event was announced. The update was initially delayed until February 14, Valentine’s Day itself, but Epic Games announced yesterday that the event would be pushed back one more day, to February 15. “We did a poor job communicating this and did not create a good experience for you,” community coordinator Sean Hamilton wrote. Hamilton also announced that, due to the delay, changes have been made to the Seasonal Gold reset. “The initial plan was to reset Seasonal Gold in version 2.5.0 which may have caused you to lose leftover gold,” Hamilton explains. “To try and avoid that we adjusted to convert the leftover gold to Firecracker Tickets. Due to the delay in the build, there is nothing in the event store and Storm Llamas have disappeared. 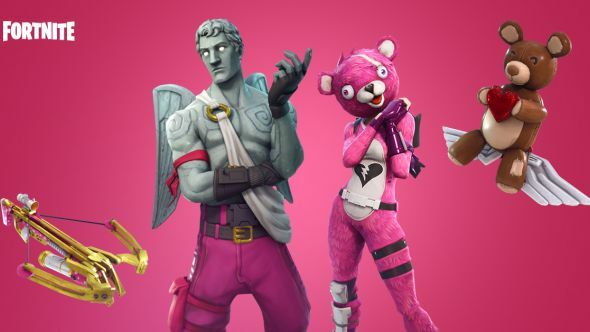 Fortnite’s Valentine’s Day update sees the introduction of Valentines-themed skins, a new glider, and Cupid’s crossbow so you can keep the romance alive. You can view the full list of patch notes and added content here.